As our dogs age, one of the more visible signs of their years beginning to catch up with them is the gradual lack of mobility, something that many senior dogs display. Caring for and understanding our dog's joints can have a dramatically positive impact on their movement as they move in to their late adult life-stage. In this article we're going to take a look at some of the common health problems that can affect your dog's joints as well as some of the tips and techniques you can deploy to keep your dog's joints in the best condition possible whether you're treating preventatively to keep his joints healthy from a young age, or searching for solutions to aid your dog's mobility. If your dog is older, you will want to rule out more serious concerns and identify whether your dog's mobility problems are due to degenerative joint disease. This is the commonest form of joint disease in the ageing dog, a situation not too different from that in humans. The disease is progressive and causes few, if any, noticeable symptoms in the early stages. It is not uncommon for a veterinarian to discover the existence of degenerative joint disease or its predisposing causes during a routine checkup. While seen occasionally in very old dogs, it is not the commonly observed arthritis that it is in people. The bulk of ageing dog arthritis cases are secondary to disorders which happened or started earlier in life. Obesity in any breed but especially in the large and giant breeds. Mechanical trauma such as falls and jumping mishaps. Torn ligaments in any joint but especially the stifle joint in toy or miniature Poodles. Chronic dislocating patella (slipped knee cap), most common in toy breeds. Osteochondritis dissecans, a disease of young dogs. Could Dog Food Help With Canine Joint Care? Could There Be a Link Between DNA & Dog Joint Health? Can Canine Massage & Stretching Help? The maintenance of major joints including hips, shoulders and elbows, is essential for the continued health and mobility of pets. Joint problems can occur at any age but are more likely as pets become older, often leading to pain, lameness and loss of mobility. Bones are jointed together by well-lubricated, gel-like cartilage, acting as a shock absorber for the joints. The healthy maintenance of cartilage is a normal bodily function, however, as animals age or sustain injury, this ability can be reduced. They lose the ability to produce adequate amounts of hyaluronic acid – the main component of synovial fluids, the joint lubricant. Production of satisfactory levels of collagen – the major building block of cartilage, can also be effected. Johnson’s 4JOINTS, in either tablet or liquid form, are nutritional dietary supplements which are specially formulated to help to maintain and promote healthy joint mobility, especially in older dogs and cats, and help to ease joint stiffness and discomfort. Combining three main ingredients for the natural support and maintenance of joint and cartilage function, namely: MSM – a source of sulphur that can be readily used for the production of connective tissue, CHONDROITIN SULPHATE – which enables joints to withstand constant compression and concussion actions experienced by healthy joints, and GLUCOSAMINE – for the production of hyaluronic acid to help joint lubrication and production of collagen. 4JOINTS also contain VITAMIN C, ESSENTIAL MINERALS such as Copper and Manganese, and TRACE AMINO ACIDS & AMINO SUGARS for the maintenance and development of healthy bones. Johnson’s full range can be found across the country in Pet Stores and Garden Centres. For further details and information, email info@johnsons-vet.com or visit www.johnsons-vet.com. Taking your dog for its daily walk may not be as much fun for your pet as you think! Is he or she just getting old, or is your dog suffering from the painful joint condition osteoarthritis (OA)? Just as arthritis affects humans, one in five dogs are affected by this debilitating condition. Sadly, it is often left undiagnosed, until a visit to the vet, often for an unrelated matter, reveals that the signs thought to be ‘old age’ are actually the result of OA. OA mainly affects larger breeds, such as German Shepherds, Golden Retrievers and Labradors, and if left untreated, this debilitating condition can greatly diminish your pet’s quality of life and consequently lead to a very painful and inactive existence for your precious pet! But how do you know if your much-loved pet has OA? And what’s the best way to help him or her? Professor Stuart Carmichael, a veterinary surgeon from the University of Glasgow who has treated hundreds cases of canine OA, believes the condition is so prevalent because sadly, owners are unable to recognise the signs of OA and are often unaware that their pet is in pain. “The major problem is that the clinical signs of arthritis are often attributed to the pets ‘just getting old’,” said Professor Carmichael. “The first step in helping your dog is to be able to identify the physical signs of arthritis,” he continued. Telltale signals that your pet may be suffering in silence include: limping, difficulty rising, stiffness, decreased activity level, reluctance to play, run or climb stairs, as well as behavioural changes such as aggression or withdrawal. Arthritic dogs may become withdrawn & depressed." If your dog has demonstrated any of these signs, an appointment for an arthritis screen by your vet is highly recommended. “It is essential for pet owners to be aware of the signs of arthritis and how it affects the dog. Just as we would go to the doctor if we are in pain, our pets need that same level of care and attention too, so that they are not left suffering,” Professor Carmichael added. The good news is that OA can be easily managed by veterinary surgeons and, although a cure has not yet been discovered, there are many ways to reduce the pain and suffering this disease can cause. Controlled weight loss and exercise programmes are usually recommended along with a course of pain-relieving medication. Additionally, as EPA (Eicosapentaenoic acid) is an effective, natural supplement, the need for drug therapy, and the potential for associated side effects, is also reduced. The use of fish oil supplements rich in EPA has been a traditional remedy for joint pain in man for decades, and according to Dr Martin Owen, an expert in canine OA, can be of equal benefit to our canine companions. “Convincing evidence from clinical studies in dogs is now emerging that clearly demonstrates clinical benefits of EPA for the management of canine osteoarthritis,” said Dr Owen. Liz Smith, 54-year-old chiropodist from Glasgow, has suffered OA for almost 4 years. Her six-year-old Scottie, Hector, also suffers from OA. Liz agrees that awareness of this condition is limited. “When the vet first diagnosed Hector’s arthritis I was in shock. I didn’t even know dogs suffered from this disease. My second thought was, oh my poor baby, because I could instantly relate to the pain he must have been feeling,” said Liz. Fortunately, following an accurate diagnosis, management of the disease and alleviation of the physical stress and associated pain can begin. It is well known that our genes can potentially dictate which diseases we will be prone to. But scientific evidence is emerging that shows that the foods we eat can help treat and even prevent certain conditions. The interplay between genes and how the nutrients found in certain foods could assist in the prevention of certain diseases is known as nutrigenomics and could, in the future, transform nutrition as we know it. According to Dr David Sargan, a geneticist from Cambridge University, nutrigenomics potentially has enormous implications not only for human health but for pet health too. “Just as certain human individuals are predisposed to specific diseases, certain breeds of dog are too, and much of my research has looked at unravelling the link between many of the genetic conditions we share with our canine companions,” said Dr Sargan. With around 450 canine genetic diseases identified, which vary according to breed, nutrigenomics has great potential to improve not only the health of our pets but also our own well-being, ranging from disease prevention to the relief of pain in certain conditions and in some cases prolonging life expectancy. “My work in canine and human genetics has demonstrated that studying common canine conditions has provided us with vital information on ways to treat these diseases in humans. In addition, the enormous suffering caused by inherited diseases in pedigree dogs can be reduced significantly if treated using nutrigenomics as a tool, either as a stand alone or in addition to medication,” he added. Professor John Innes, from the University of Liverpool, one of the principal investigators in the development of this technology, believes the application of nutrigenomics heralds the beginning of a new way forward in the treatment of many chronic conditions, without the need for invasive surgery or the potential side effects of drug therapy. “The science of nutrigenomics will give us further insight into understanding the onset and progression of many diseases, and gives us one more tool in our ongoing quest to treat and prevent illness,” said Professor Innes. “We know that the progression from a healthy state to a disease state occurs through changes in gene expression, which can be influenced through ingestion of dietary factors, and the introduction of pet foods based on these findings is an important step in helping to further explore the concept of nutritional therapy in the treatment of debilitating human and canine diseases,” he added. Dog massage expert, Jorn Oleby, gives his insight below in to how you can use massage and stretching to help with your dog joint care efforts at home. There is a growing interest in various complimentary methods of pet health care. Massage and stretching is one such practice which could considerably improve the quality of your dog’s life and may enable your pet to enjoy the natural agility of youth for many more years of its life. As a canine physiotherapist I treat dogs with muscle, tendon, joint and ligament related problems and injuries. My activities include a number of different forms of treatment including electrotherapy, acupuncture, laser treatments, massage and stretching. An important part of my job is to inform and improve knowledge about the everyday care of dogs in areas such as hygiene, coat and paws, nutrition, exercise and training. Massage and stretching can considerably improve the quality of your dog’s life. The dog may be able to enjoy the natural agility of youth for many more years of its life. Massage and stretching are a complement to daily exercise, obedience training and diet and are suitable for all dogs regardless of breed, age or size. 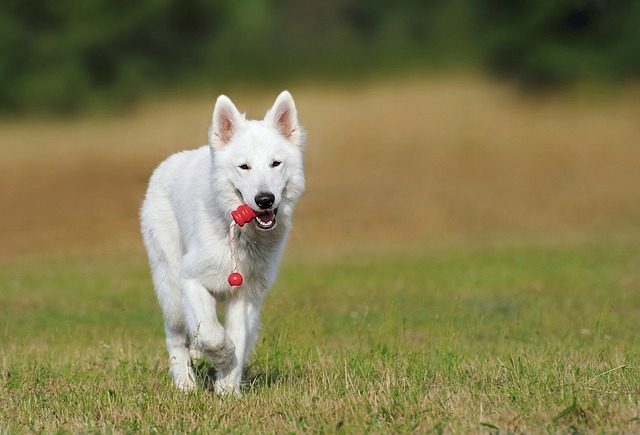 Many dog owners invest considerable time in activating their dogs by obedience training, seeking activities, tracking and protection exercises at training grounds, out in the countryside or in the forest. We might present dogs at shows and judge their appearance and breed attributes. These activities allow us to spend time with our dogs while also keeping them physically and mentally alert. We also spend time to improve the everyday care of our dogs in areas such as hygiene, coat and paws, and nutrition. We easily spend a considerable amount of time and money every year on the caring and training of our dogs. We do tend to “forget” a simple and low cost preventive treatment. That is massage and stretching. The cost of massage and stretching is low and is a great and important investment in our dog’s health. The knowledge of massage and stretching cost so little but gives so much. Let me take an example from a “normal” day. We all agree that we do feel better when we are exercising. Maybe we go out for that weekly jogging round and of course we bring our best friend with us for company. When we get to the woods we do not dash out of the car and run for our lives a couple of hundred metres and then stop, making some short explosive rushes and then stop again. After that we run as hard as we can again for some more hundred metres. And so on. our 3 or 5 kilometres round we slow down to jogging tempo for a while and then slowing down further to walking. And when we have stopped we use some minutes for stretching our sore muscles. I think we all can relate to this. We will feel much better the next day after some stretching. And then of course who wouldn't like some massage afterwards as well. Well, that was us. How are we treating our best friend in a similar situation, maybe at the training ground or out in the woods for a longer stroll? How many times haven't we just released our dog and then it has taken of like a tornado. Maybe we have thrown balls or sticks for it to catch and so on. Honestly, why are we not as generous to our dog as we are to ourselves? It is so easy to do the same procedure with our dog. First remember that the dog should have warmed up before starting the exercise. I also strongly recommend that you allow your dog to wind down after the exercise before any stretching activities. Here is a check list that could be used before the exercise. Warming up does not tire the dog but rather increases blood circulation and warm up the muscles ensuring that the joints are lubricated and more supple. The dog is now ready to perform. After the warm up you could also easily test your dog’s mobility using the eight most common stretching grips. You should be sensitive to your dog’s signals. The dog should not experience any discomfort. If it does, don’t hesitate to contact the vet. After completing the exercise let the dog wind down and then carefully do some stretching exercises. And when you come home reward the dog with massage and you will get a happy performing dog ready for new challenges. Massage and stretching is an essential and low cost investment in your dog’s health and future competitions. Massage is by far the best treatment for reducing muscle tension and the recovering period is reduced. You can progress faster with tougher training if you integrate massage and stretching because the muscles are assisted in the work of increasing the absorption of nutrients and the removal of lactic acid. Massage also extends the tissues and muscles we are unable to reach through stretching. Massage and stretching will give you a relaxed and better performing dog. Stretching is when you extend an extremity towards it’s ultimate position, in other words you separate the muscle’s root and insertion, holding this position for a moment. With stretching you work up good mobility in the muscle and around the joints and you also reduce the pressure on the joints. I think that we should pay greater attention to assessing mobility to encourage the sort of care that can spare dogs unnecessary injuries in the future. A well-functioning dog has retained its natural elasticity and suppleness. “Hold the dog’s elbow with one hand, grasping the wrist with the other. Move the leg forward and upwards, stretching the elbow joint and the flexor muscles of the foreleg (shoulder joint)." Stuart Carmichael is a Professor of Veterinary Clinical Studies, the Director of the Small Animal Hospital at the University of Glasgow, an RCVS Diplomate in Orthopaedics and recognised Specialist in Small Animal Surgery. He is also past Chairman of the British Veterinary Orthopaedic Society. With a career spanning 20 years and a passion for animals of all sorts, Professor Carmichael is considered a leader in the field of canine osteoarthritis (OA) and small animal orthopaedics. After graduating from the University of Glasgow in 1978, Professor Carmichael worked within the Surgery Faculty as a lecturer in surgery and orthopaedic surgery before moving to private referral practice in London in 1990. In 1991 he was appointed Director of the Queen Mother Hospital for Animals at the Royal Veterinary College in London before returning to the University of Glasgow in 1996. In the same year, he was awarded the BSAVA Simon Award for contributions to veterinary surgery. With a particular interest in the evaluation and management of animal OA, Professor Carmichael is currently working on a scheme to improve the results of OA management in general practices. This modality is FDA approved and non-invasive, 1-3 treatments required. Visit http://www.pulsevet.com or contact me for more studies and information!